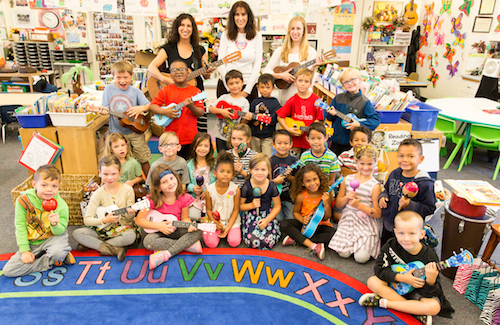 Guitars in the Classroom, a 12-year NAMM Foundation grant recipient which serves over 260,000 children per year, is dedicated to increasing literacy and learning across the curriculum through integrated music making in public elementary school classrooms. They seek to expand the role of music in education by training elementary school teachers to teach all subjects through the power of hands-on music and song. By providing responsive professional development training, artist residencies and access to musical resources to participating teachers, schools and school districts, GITC is helping teachers increase student engagement and success in 34 states. Guitars in the Classroom strives to involve and include everyone in music because of its power to break down barriers, relieve stress and unite everyone working with students in song. They believe the more adults in schools (teachers, administrators, counselors) who are comfortable singing and playing, the happier schools become, improving school culture and creating new opportunities for general music education programs to grow. Like the mission of The NAMM Foundation, Guitars in the Classroom sees music education as a right for all students, celebrating the intrinsic value of music education as a medium for positive self-expression, classroom community building and academic learning in every subject area. The NAMM Foundation Music Making Grant helps to validate and support the musical process as a strategy for teaching and learning all subjects.